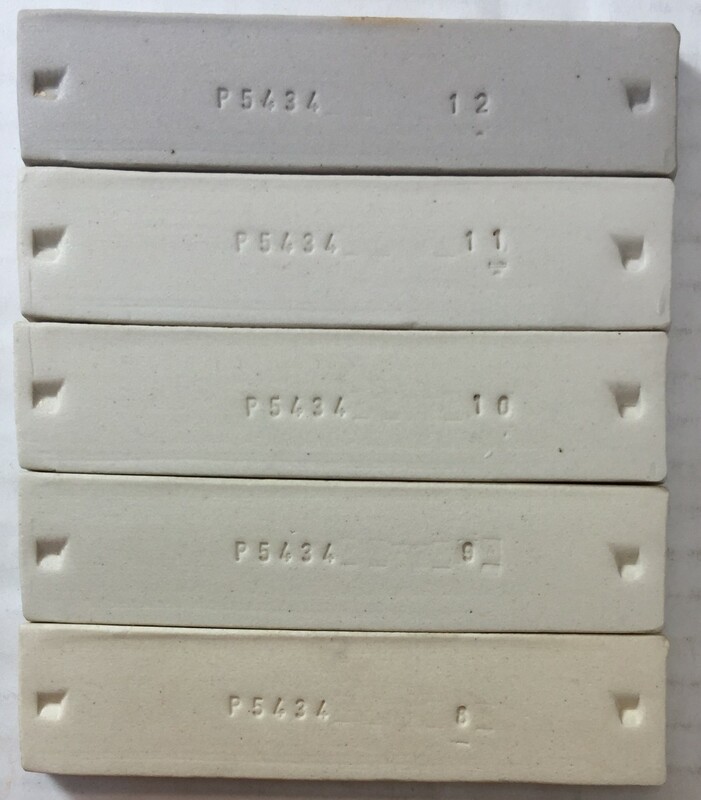 High temperature, smooth, medium plastic, grey-white firing, refined body for reduction and oxidation porcelainous stoneware. P580 is a variation on the classic '25 Porcelain' mix (25% ball clay, kaolin, feldspar, silica). It uses a blend of 36% ball clays and 12% kaolin to produce a body of greater plasticity. It also has additional bentonite to increase plasticity further. P580 maintains excellent drying properties and is well suited to machine production since it has high leather hard and dry strength compared to porcelains. While P580 is not quite as white as fine porcelains, it still maintains near zero absorption for functional ware. Thus it is a material-of-choice compared to porcelains if the fired color is acceptable for your application. However, if you can tolerate a slightly darker fired color, we recommend H555. P580 is a smooth and slick fine grained body that throws and dries quite well compared to all-kaolin porcelains. Its ball clay complement gives it a robust nature that makes it a good choice for machine forming and even hand building. It generates very little slip during throwing and does not work as well when too soft as do more plastic bodies. However, P580 is fine grained and thus it cannot be expected to dry and handle as well as a coarser stoneware. If you need to join sections, be sure to follow good practice (i.e. use slip containing an aggregate like molochite, dry ware evenly, use as much pressure and lateral movement as possible when joining, make ware with an even cross section). P580 fired bars. Cone 10R top. Cone 8 to 11 oxidation (from bottom up). P580 fires darker than P600 or P570. However, its color is stable across the cone 8-10 range in oxidation and its reduction color is quite consistent from firing to firing. P580 is quite mature (but not vitrified to zero porosity), it contains 24% each of feldspar and silica. It thus produces a very strong product. Thus you must take precautions to make shapes that have inherent strength to resist warping (i.e. avoid goblets with flared bases, flared or overhung bowls). Kiln shelves must also be be flat. You may need to use a little kiln wash to separate lids and vessels. P580 has a fairly high flint content and is thus easier to fit glazes to than P600. P580's high strength can be severely compromised if a glaze is under excessive compression or tension. We recommend that you stress-test a piece of ware using a boiling water:ice water test. Ware should be able to survive several two-minute cycles before trouble appears. If you need assistance to adjust the thermal expansion of your glazes, please contact Plainsman. If you wish to use slip on your ware, make it from a base of P580 itself if possible. P580 mugs fired at cone 10R. Pure Alberta Slip as a glaze outside. G1947U clear glaze inside. 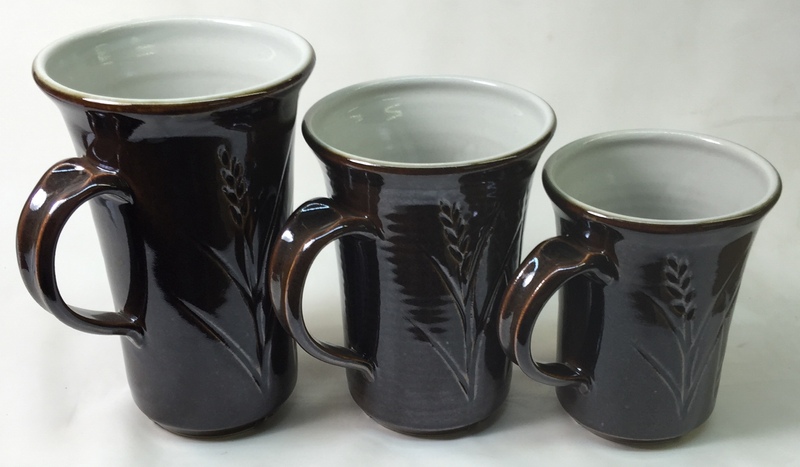 Glaze employs Grolleg Kaolin (left two mugs) and EPK (right mug). By Tony Hansen. Large plate by Peter Flanagan. P580 body. The dark slip is colored P600.